When Kim Clijsters beat Caroline Wozniacki of Denmark 7-5, 6-3 to win the 2009 women's singles title at the US Open, she not only added a second Grand Slam triumph to her 2005 US Open victory but also joined an elite list of champion mothers. The Belgian star is the first mother to win a Grand Slam title since Australia's Evonne Goolagong won Wimbledon in 1980. It was an emotional victory after two years on the sidelines during which Clijsters gave birth to daughter Jada. Born June 8, 1983 in Bilzen, Belgium, Clijsters is the daughter of Belgian international footballer Leo Clijsters and national gymnastics champion Els Vandecaetsbeek. Here's a look at some Super mums of the sports world. 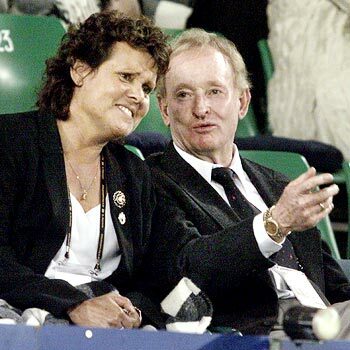 Evonne Goolagong Cawley became an inspiration for working mothers the world over when she won Wimbledon in 1980, three years after giving birth to daughter Kelly. The Australian was the first mother to win a major in 66 years and her feat stood unmatched until Clijsters came out of retirement to win her second US Open title on Sunday with her 18-month old daughter Jada in the stands. Cawley, a former world No 1, was one of the world's leading players in the 1970s and early 1980s, winning 14 Grand Slams titles: seven in singles (four Australian Open, two Wimbledon, and one French Open), six in women's doubles, and one in mixed doubles, 13 of them before she became a mother. As a 29-year-old mother she defeated Tracy Austin and Chris Event to win won her second Wimbledon singles crown in 1980, the first title coming in 1971. She retired in 1983, after having son Morgan in 1981. 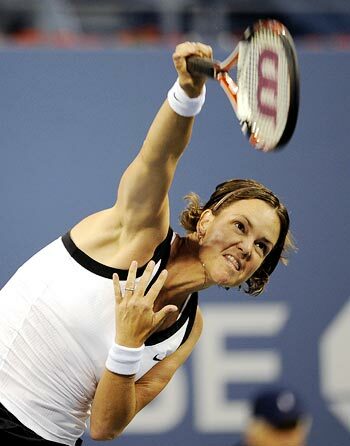 Former World No 1 Lindsay Davenport won three Grand Slam singles tournaments and an Olympic gold medal in singles. The American, who finished 1998, 2001, 2004, and 2005 as the top-ranked player, took a break from competitive tennis in late 2006 and much of 2007 to have a baby. On June 10, 2007, she gave birth to a baby boy, Jagger Jonathan, and then returned to the tennis courts. In her comeback tournament, she partnered Lisa Raymond in the doubles competition at New Haven, where the team lost in the first round to top seeds Cara Black and Liezel Huber. Davenport returned to singles competition in Bali, where she won her first title since 2005, defeating Daniela Hantuchova in the final. Her second tournament in Beijing saw her defeat fourth-seeded Russian Elena Dementieva in the quarter-finals before losing to Jankovic in the semi-finals. Later in 2008, Davenport won the ASB Classic in Auckland, the first WTA tour event of the year, defeating Aravane Rezaii in the final. She then took time off and had a baby girl, Lauren Andrus, on June 27, 2009. Long-distance runner Paula Radcliffe took a break through the 2006 season owing to injuries. The British runner, who is married to her trainer Gary Lough, a former Irish international 1500m runner, in January 2007 gave birth to her first child, Isla. She made her return to competitive running in September the same year, and with baby watching she won the New York marathon on November 4. The triumph came less than ten months after delivery. Dara Torres, the first American swimmer to compete in five Olympics, showed age is no barrier to excellence in sports when, at the age of 40, she won the gold in the 100 metres freestyle at the US Nationals in Indianapolis on August 2007. The win came in just 15 months after giving birth to her first child, Tessa. Later that month, she twice broke her 50m freestyle record, 26 years after she first set the American record at just 15 years of age. In the 2008 Beijing Olympics, Torres competed in the 50 metre freestyle, 4 x 100 medley relay, and 4 x 100 freestyle relay and won the silver medal in all three events. Irish 5000m runner Sonia O'Sullivan was a dominant force for most of the 1990s and early 2000s. At the 1993 World Athletics Championships she won the silver medal in the 5000m. She bettered her record in the 1995 World Athletics Championships, winning the gold medal, which made her the world's leading female 5000m runner. O'Sullivan took a break from competition for most of 1999, during which time she gave birth to her daughter, Ciara. However, it didn't take her long to return to the track, and win a silver medal at the 2000 Sydney Olympics. She also won three European Championships gold medals and two World Cross-Country Championship gold. 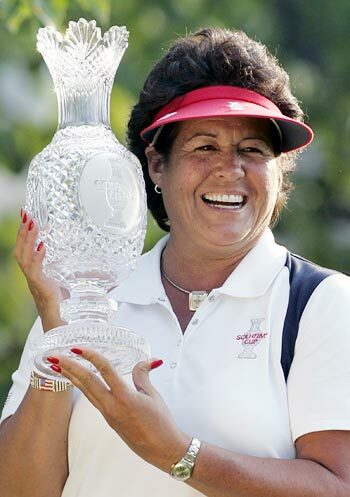 American professional golfer Nancy Lopez is a winner of three major championships. She won multiple times in each year from 1980 to 1984, although she played only half-seasons in 1983 and 1984 due to the birth of her first child. Returning to golf again, Lopez posted five wins, five seconds and five thirds, won the money title, the scoring title and the Player of the Year award. She was also named Associate Press Female Athlete of the Year for a second time. Scottish professional golfer Catriona Isobel Matthew, better known for her win in the inaugural HSBC LPGA Brasil Cup 2009, an unofficial LPGA event. The victory was a sweet gift as Matthew was five months pregnant with her second child at the time of the victory. The golfer then went on to win the Royal Lytham and St Annes. 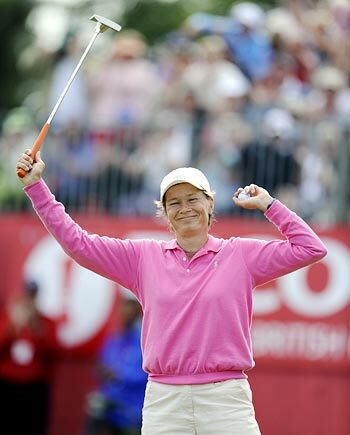 She won the Ricoh Women's British Open with a final score of 3-under-par over second place finisher Karrie Webb. It was her first win in a major tournament. The victory came 11 weeks after she gave birth to her second daughter, Sophie. Interestingly, she is the first player from Scotland to win a women's major golf tournament. - Then, there was Dorothea Katherine Lambert Chambers. The British tennis player better remembered to have played the longest Wimbledon final till that time. In 1914, she went onto win the US Open as a mum. In 1919, Chambers played the longest Wimbledon final up to that time: 44 games against Frenchwoman Suzanne Lenglen. Despite the interruption of World War I, Chambers was in 11 Wimbledon singles finals, the last in 1920 when she lost again to Lenglen, and, at 41, was the oldest female finalist. Continuing to play at Wimbledon through 1927, she played 115 matches in all there: 32-8 in singles, 29-11 in doubles, 24-11 in mixed. Dolly, as some called her, won two of her Wimbledons after the birth of her first child, two more after the birth of her second.